It is hoped that this review will stir interest at DG or reissue companies such as Naxos or Arkivmusic. A man is on a bench on a station platform, slowly waking from a nightmare. He is agitated: “Time. What time is it?” He looks for a clock, becoming aware of the music in his head which disturbs him continuously: “Silence. Silence. Silence!” Gradually the music stops: “It stopped. Good. That’s called mental discipline. Missed the train! Missed the train! Yet again!” So begins Marc Neikrug’s heartbreaking odyssey Through Roses. A man, a Holocaust survivor and once destined to have been a great violinist, is possessed by the memory of his experiences at Auschwitz. As fate would have it, it was his ability to play the violin that kept him alive in the death camp. His role was to play music mornings and evenings for the work details leaving and arriving back to camp or to give “concerts” for the benefit of the camp’s commandants and their families. Sometimes, they’d have to play waltzes, faster and faster, as old men were forced to dance until they collapsed and sometimes, they’d have to play, as prisoners – women and children alike - were led to their deaths in the gas chambers. The commandant lived just beyond the perimeter of the camp in a nice house with his wife and two children. This house happened to have a perfectly manicured lawn with a beautiful garden, maintained by his wife, featuring lovely red roses. This house was so close to the crematoriums that the shadows of the smokestacks fell on the lawn on particularly sunny days. There was a path between this house and the fence of the camp that led directly from inside the camp to the crematorium where the bodies were carried all day, every day. This is the backdrop of the nightmare that is Through Roses. The musical style is that of “Sprechgesang” invented by Arnold Schoenberg in 1912 with his Pierrot Lunaire. Interestingly, the work most reminiscent is Schoenberg’s own “A Survivor from Warsaw” of 1947. The violinist, clutching his violin at all times, here so torturously and movingly portrayed by the late German actor Will Quadflieg (1914-2003), recounts his experiences in painful flashbacks that still torment him forty years later. The score, for eight solo instruments, quotes fragments of military marches and popular songs, the slow movement of Haydn’s Emperor Quartet – which happens to be the melody of “Deutschland, Deutschland uber alles”, Beethoven, Paganini, Wagner, Berg, Mozart, Schubert and Bach. The Bach, for example, which serves to represent a particularly painful moment the protagonist recalls, is played in an imprecise manner representing the distortion of the incident in the man’s memory. The music alternates between the lovely tunes he was forced to play as a prisoner as he remembers and the angular, atonal music representing his present nightmarish existence. Zukerman’s playing throughout is especially notable. The original music composed by Neikrug is so effective and the interpolation and overlapping so successfully realized that you are there with him in his mental prison that has taken the place of the camp. Quadflieg masterfully and touchingly communicates the guilt, horror and poignant resignation of his character living in his solitary hell. The text was written by Neikrug himself and there are episodes here of great poignancy and poetry – the man trying to scratch off the number tattooed on his forearm, the man remembering the great promise he held of a virtuoso career before the war, recalling a lost love, lamenting his sleeplessness and his inability to remember his dreams, the trains and the dogs of the camp, the smell of the prisoners, the whining, the screaming, the unthinkable inhumanity of the guards, the savage treatment of the children. Perhaps in the future, we may pass someone on the street, maybe haggard, maybe tormented, maybe with desperation or tragedy in their eyes – maybe we’ll stop and consider what may have led them to this sad height before we judge too harshly. The work is performed in German - the booklet has notes and the full text in German with an English, French and Italian translation. Unfortunately this CD is out of print but is well worth the attempt to track it down. 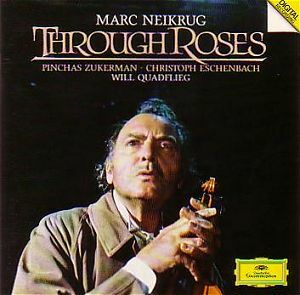 There was a film released of Through Roses in 1997 in a German production starring Maximilian Schell and directed by Jurgen Flimm which may be hard to find but was available on DVD. A word about the composer: Marc Neikrug was born in New York on 24 September 1946, the son of the well-known and highly respected cellist George Neikrug; his mother was also a cellist. In 1964 he entered Detmold University in Germany and in 1971 received a Masters of Music from the State University on New York at Stony Brook. He studied with Gunther Schuller at Tanglewood and with Rudolf Serkin in Marlboro. His duo partner as a pianist has been the violinist Pinchas Zukerman for many years and they have toured and recorded together extensively. Another popular and acclaimed work of Neikrug’s is an opera “Los Alamos”, an anti-nuclear piece which was the first American work commissioned and premiered by the Deutsche Oper Berlin. Maestro Neikrug is currently the Artistic Director of the Santa Fe Chamber Music Festival. The current lack of an available recording of this unequivocal masterpiece is inexplicable. It remains one of the most moving pieces that I’ve ever experienced and one of my most cherished discs. This particular performance should be re-released and a new recording is long overdue.